Charming authentic Tuscan house vacation rental built in the classical sandy colored stones. This Italy holiday home is located in a special position near Pienza - the known cheese capital of Southern Tuscany and Bagno Vignone - a quaint little town whose main square is actually a huge Roman bath - the thermal waters are still visitable only a short distance away from this town. Restored to its orginal simplicity the owner has delightfully recreated a true Tuscan atmosphere in this lovely Italian villa rental. There are three full size bedrooms each with its own particular charm, orginal artwork and soft Tuscan color scheme. This self catering Tuscan villa rental offers the luxury of being in the classical Tuscany countryside - yet close to small towns where you will find restaurants, cafes and shops. There are many modern day comforts in this Italy villa rental - including a completly renewed kitchen and Sat TV - not to mention the open face fireplace and the cozy sitting area where you can relax and enjoy a little Tuscan wine. Villa Flora has a picturesque covered terrace where you can sit out and enjoy the view from your Italy villa overlooking the small town of Seggiano which is less than one km and the soft rolling hills which are so characteristic to Tuscan and this villa rental. The ground floor of the house enters to a spacious room divided into three areas. There is a fully equipped kitchen, dining room table for up to 10 people and a comfortable living room area with a cozy fireplace, SAT-TV and DVD. The kitchen is brand new and beautifully equipped with all modern amenities like electric oven, refrigerator with freezer box, 4-burner stove, dishwashwer, American coffee maker. There is a full bathroom with a shower box, WC, sink and bidet on the ground floor where you will find a clotheswasher as well as an iron and ironing board. Upstairs you will find three bedrooms. There are two bedrooms with queen size double beds and one bedroom with two single beds. 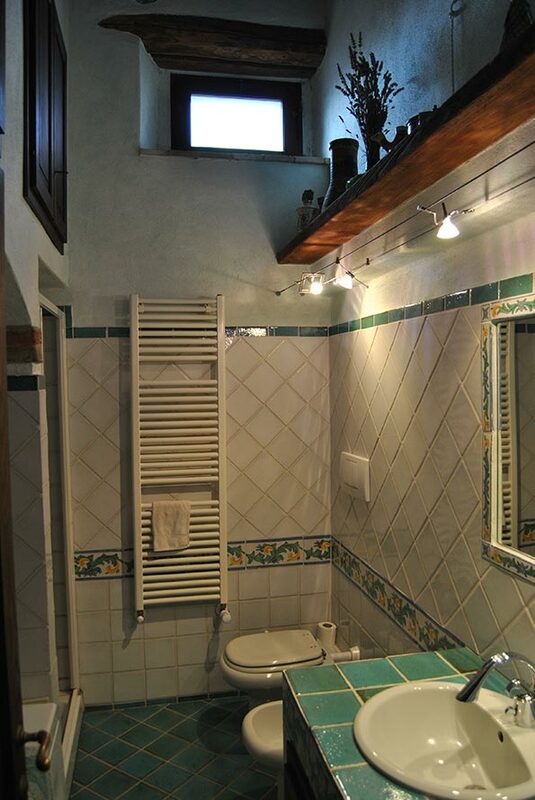 There is also a large bathroom located on the first floor of this apartment - each bedroom boasts a goregous view of the small town of Seggiano. 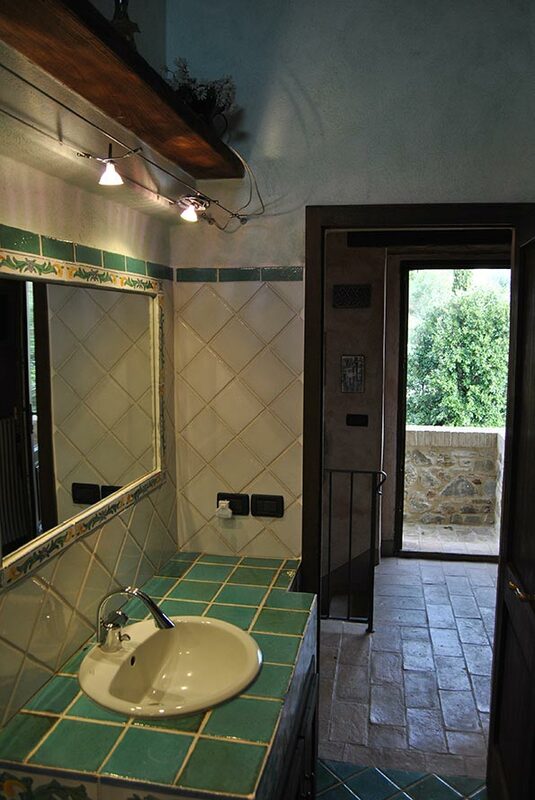 This house is in a great position for expoloring the nooks and crannies of the southeastern part of Tuscany. You will find easy access to towns such as Siena, Montepulciano and Pienza. An extra plus is the proximity to Lago Bolsena and the healing waters of Bagno Vignone less than 20 minutes from the villa. A day-trip to Rome through the ancient Cassia (SS2) is worthy for its beautiful views, specilly over the lakes Bolsena and Bracciano. At Seggiano which is only 1km from the villa you can visit a beautiful spa pool located in a breathtaking panoramic position. The swimmingpool of irregular shape covers an area of 120 square meters and has a depth of 1.10 m and a constant temperature of 32 degrees. Electricity is paid upon consumption! In this Villa your consumption of electricity is metered and has to be paid at check out! "- cleaning; - The tranquility of the place; - The view; - The comfort of the estate. " Beautiful setting and a very nice villa. Fioranna and her husband greeted us in a driving rain, and showed us around the place. The kitchen was very nice with plenty of utensils, pots and pans, and cutlery. Seggiano is a bit out of the way, but is incredibly beautiful, and the view from the villa is spectacular. Actually, the location is not all that far from towns like Montalcino and Montepulciano, and we took lots of day trips around the area. One thing that I didn't realize until we got back is that there is a great sculpture garden in Seggiano created by the artist Daniel Spoerri. So that is worth a look. The Seggiano Cafe at the bottom of the hill has great espresso, cappuccino and amazing "twists" that they bake in the shop. We quickly made that our morning ritual before setting off on our next day trip. The Santuario della Madonna della Carità (Our Lady of the Charity Sanctuary) is really beautiful, and the cemetery is lovely, with long rows of crypts with fresh flowers on nearly every one. Most of the crypts have photos of the people interred. The neighbours were friendly, the owners knowledgable and the view down into Seggiano was so peaceful. No one complained about me playing my bagpipes. Look close around the villa before travelling any distance. The closest mountain towns have some of the most welcome attractions. All went well. The villetta was wonderful and the view spectacular. The mornings on the terrace were so peaceful and the evenings were unbelievable. After a full day touring it was a pleasure to come home, find dinner and sat out on the terrace and look at the stars. We also enjoyed playing with the little black & white kitten ... he was a joy to watch - very entertaining. Hope to visit you again! Like living a postcard! The roads and maps provided a challenging experience and wonderful, unexpected locations. The villa was more than we expected: quaint, beautiful and comfortable. Seggino towns people were warm, friendly and helpful and pointed us to the grocery store. All together it was a wonderful experience! This is a wonderful place! Truly enjoyable - with so much charm. Thank you for helping us celebrate our 60th birthday! Thank you for the lovely welcome and warm humanity of the owner Fioranna. The house and the area around are exciting as well as the roads to the house - especially with motorbikes! Fioranna organized a garage for us in Seggiano and not to forget the great olive oil! We used it for every dinner. We have enjoyed glasses of wine each evening and the great view with the sunset from the veranda. We had a wonderful time! We loved to stay at the villa. The view from the terrace is the best! We loved sitting our there in the sun. Our visit was more than we expected. The clean beautiful villa only added to the trip. Magnifico! Villa Flora was beautiful. The views and the villa itself. Enjoyed the little restaurants in town. Wonderful villa that exceeded all of our expectations - spacious, beautifully decorated, with a well furnished, beautiful kitchen. Gorgeous sunsets with a view that was even more spectacular than the photos suggested. Owners were wonderful -- extremely warm, accomodating and hospitable. Can't imagine anyone being disappointed with this rental.